Heaney takes us back a good sixty years to a less sophisticated time before the liquidizer and other modern implements, to an age of bare hands/ and cast iron. The emblems chosen to illustrate the moment (fully recognisable to those who lived through the post-war period) hold a clue to the design of the snedder: the clamp-on meat-mincer/ the double-flywheeled water-pump. 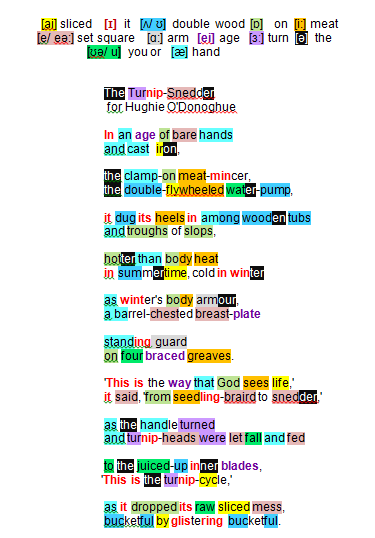 The machine personified by Heaney is solid, obstinate, not to be moved: it dug its heels in… In contrast the yard in which it stands is farm-typical with wooden tubs … troughs of slops. Sense data associated with touch are introduced: its cast-iron exterior is hotter than body heat/ in summertime, cold in winter/ as winter’s body armour; the implement is depicted as the classical armed-man adding to its solid, uncompromising stance with barrel-chested breast-plate/ standing guard/ on four braced greaves. Heaney endows his soldier/ snedder with an equally single-minded, unintelligent mentality and voice to match: This is the way that God sees life/… from seedling-braird to snedder. The God described by the snedder evokes Dantesque images and medieval and Renaissance paintings, particularly those of the Last Judgment depicting the fate awaiting poor souls as they are fed into Hell’s ‘mincer’! The implement exemplifies ‘the turnip-cycle’: it is a metal executioner, beheading turnips and turning them to purée for cattle feed. The snedder appears to derive pleasure from the textures and colours of the liquidization process: juiced-up inner blades … raw sliced mess, bucketful by glistering bucketful. a meat grinder or meat mincer invented by Karl Drais in the 19th century and now out-of-date is a kitchen appliance (made of cast-iron and clamped to the working-top) for grinding, fine mincing or mixing raw or cooked meat, fish, vegetables or similar food. pre WWII water pumps were based on flywheel engines, that is engines that has a large flywheel or set of flywheels connected to the crankshaft. The flywheels maintained engine speed. When these engines were designed technology was rudimentary compared with today’s and all parts were made very large. The engine material was mainly cast iron and all significant engine parts were cast from it. the choice of glistering provides the first example of a more unusual Middle English/ Shakespearean lexis, to which Heaney’s expertise as a language scholar gives him access and adding, of course, to the obsoleteness of the of the snedder itself.